A steady day for passage, on the move (south unless stated) were 1 Fulmar + 3 north, 2 Manx Shearwater north, 97 Gannet + 104 north, 6 Cormorant, 5 Common Scoter + 2 north, 3 Oystercatcher, 2 Dunlin, 1 Whimbrel, 3 Curlew, 2 Turnstone, 49 Black-headed Gull + 91 north, 1 Mediterranean Gull north, 25 Common Gull, 3 Lesser Black-backed Gull + 1 north, 2 Great Black-backed Gull, 3 Common Tern, 14 Sandwich Tern + 42 north, 100 Auk sp + 13 north, 4 Puffn, 360 Swift, 6 Sand Martin, 36 Swallow and 1 Flava. 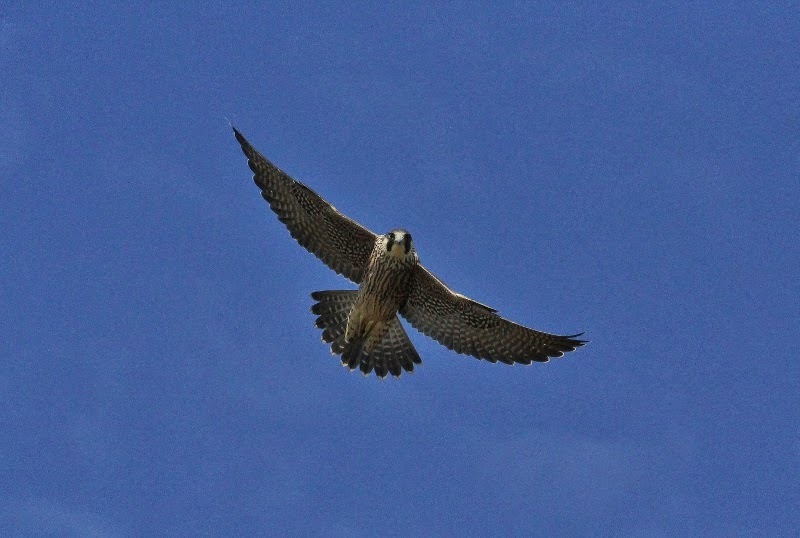 Three Juvenile Peregrine were in the Long Nab area and 13 Grey Heron were on Johnson's Marsh. An interesting record, and a first for the area, was an Ocean Sunfish basking off Long Nab slowly drifting north about 150 meters offshore.